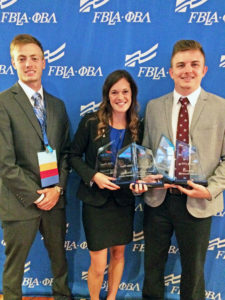 Williams Baptist University’s chapter of Phi Beta Lambda business society traveled to Baltimore this summer for the National Leadership Conference, winning a host of awards in the process. PBL, which is comprised of college business students, is the collegiate extension of the Future Business Leaders of America. Williams student Betsy Ryan earned fourth place honors nationally for presenting WBU’s Gold Chapter Report. Ryan and fellow WBU student Oni Robertson teamed up to win fifth place honors in two categories: Small Business Management Plan and Emerging Business Issues. Also distinguishing himself as a WBU representative was Allen Thompson, who qualified for the final round in Business Decision Making. The National Leadership Conference was held June 23-26. Earlier this year, the Williams PBL group earned Gold Chapter Status at the state conference. In order to become a Gold Chapter, PBL chapters must meet certain expectations. WBU’s PBL participated in more events at the state competition, interacted with local FBLA chapters and business professionals, completed community service projects and raised money for charity to once again earn the golden status.